-JdK- This picture was posted a few days ago and now we know it's NOT Denis Minett in the saddle. Richard identified the rider as a mr H A R Earle. -Richard- The chap sitting on the bike talking to Francis Beart is H A R Earle. This picture was taken at Brooklands on October 27th 1938 and the occasion was the 350cc 3 hour record attempt. Earle was to share the riding duties with Noel Pope and as can be seen by Beart's attire, it was a very cold day for the time of year. Earle took the first stint and completed over 50 laps at record speed when the extra large fuel tank sprang a leak and brought the attempt to a halt. The fuel tank looks just the same as the one Jimmy Guthrie used for the 1935 1 hour Montlhery record and could be the actual tank as Beart had a close relationship with Nortons. 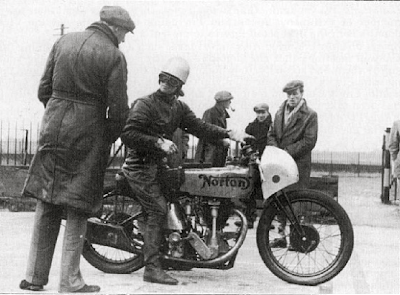 The frame also looks to be a 1934 works item and the bike seems to have appeared at various times with 350 and 500 engines. The following day, 28th October, a second attempt was made with a standard racing tank now fitted and an over-night top end strip-down made to check how the motor was running. The weather was better for the second attempt but Earle was not feeling well and was unable to maintain the pace he had achieved the previous day. As the lap speed fell, Beart realised he had to call in Earle and put Pope in the saddle. Pope pulled out all the stops and the record bid was back on target as Pope's lap times fell until a misfire set in. The situation looked grim as the smaller fuel tank already dictated an extra stop and the misfire became worse. Luckily a new spark plug cured the problem and Pope was back to even faster lap times and as the 3 hour duration passed the time keeper gave the news that the record had been taken at over 93mph including stops. Pope was called in straight away, he must have been exhausted after more than 2 hours and no rear suspension over the concrete slabs. Earle went back out and continued the run to the 500km mark which broke the existing record by more than 5mph.